These trolleys and covers are situated at the seaward end of row 21 (the row next to Reeves Beach). They appear to be abandoned, if you own one of the trolleys and/or covers please contact the Beachmaster. If the items are not claimed by their owners they will be moved to Reeves Beach awaiting disposal through the process defined in the WYC Storage Policy. Well done to the Winter Series Prize Winners! Sunday saw the last scheduled race of the 2018 club racing programme. Unfortunately do to a combination of a very high tide (and flood warning), rough see and cold conditions the racing was called, off, but those who came down were still entertained by some hardy Laser sailors who braved the rough launch conditions to go for a blast! Onshore we were treated to a buffet, courtesy of Charlie Campion (thanks Charlie!) and Prize Giving for the Winter Series. Congratulations to Christian Brewer who won the Laser class, followed by Niall Martin in 2nd and Steve Gray in third. Congratulations to Dickie Ledger and John Berrington on their Dart 18 for winning the General class, followed by Robert Govier and David Figgis on their Tornado in second, and Luke Swain in third on his A-class. 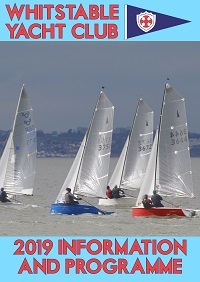 The 2019 season isn't far off, with the first race scheduled for Sunday 10th March. In the mean time, please take your mast down if you haven't already (or let Sally in the office know if you're planning to keep it up for the winter)! Congratulations to Tom Oliver who has been successful in his application to the RYA SE Youth Training Fund for a Performance Bursary. 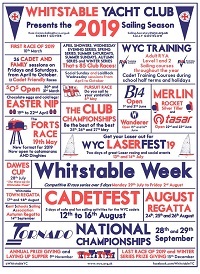 The Bursary is awarded based on merit, and is targeted to support young sailors in their sailing, be that in competitions, training, clothing or equipment. Tom is a regular sailor in the Laser fleet, and has been active within WYC Training, supporting courses and cadet sessions this year. It's great to see another of our young sailor's potential being recognised in this way by the RYA!